In any house of worship, clarity is key. "Proclaiming the Word of God, in speech and in song, must be clearly understood by everyone," said Timothy Frederick, Bethlehem's director for media ministries. Bethlehem Baptist Church, which celebrated its 140th anniversary in 2011, is a multi-campus church based in downtown Minneapolis, MN. But since its Minneapolis campus' current sanctuary opened in 1991, Bethlehem's style of worship has changed dramatically. "Because of the multi-ethnic expressions of our congregation and our focus on blended worship," Frederick explained, "the breadth of music ranges from choir and orchestra, to contemporary and ethnic worship ensembles." To speak to those needs, Mark Pearson of CCI Solutions specified two Tannoy VQ 60s, placed in an exploded mono cluster roughly 15-feet apart, flanked by one VQ 40 per side, and a VS 218DR sub - flown between the VQ 60s - for LF support. "We needed 210° of coverage because of the shape of the room, but it's also very shallow on the sides, so we had to have a box that was very directional to fill in those areas and the VQ 40MHs were great for that. I used a pair of Tannoy studio monitors on another job years ago and loved how articulate they were," Pearson said. "Basically, for Bethlehem, I wanted a bigger version of that." The church's pre-existing system didn't provide anything close to that, Pearson continues: "Many elements were showing their age, but Bethlehem still didn't need a concert, line array system." They also had an existing under balcony system comprised of Tannoy V8s, which, Pearson says, "was another reason we leaned toward Tannoy; because we knew they would match those existing speakers." In addition, six Tannoy VX 12Qs were deployed to cover the balconies themselves. 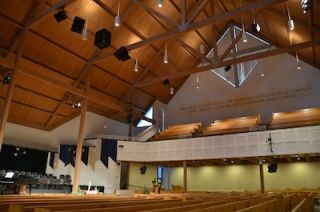 "The sanctuary seats over 900 people, has balconies on three sides and a 70-foot peaked ceiling. It's beautiful, but quite live," Frederick said, "and we felt that a Tannoy system like CCI Solutions recommended was the best choice." "Pairing Tannoy with Lab.gruppen amplifiers was a beautiful thing," he added, citing the monitoring and control provided by Lab.gruppen's NLB 60E NomadLink Bridge and Network Controller, the overall headroom available and the Contractor Series' efficient power usage. In total, one Lab C 10:4X was used to drive the under balcony speakers, one C 16:4 for the VQ 60 mid/high drivers and two C 28:4s for the over-balcony speakers and two Lab C 88:4s for the VQ60 low drivers and the subwoofer. "We can push it as hard as we want without worry. A few weeks after the install, we hosted a concert by Christian artist, Andrew Peterson. He came in with a full band and the sound was fabulous. We walked out of the concert thinking 'that's exactly what we wanted; clear, robust, concert quality sound. We're thrilled!" Installed in August 2012, the system allows Bethlehem to retain a traditional atmosphere, while providing their multi-ethnic, cross-generational congregation with rock solid sound that will enhance their ability to express their faith in myriad different ways, long term.